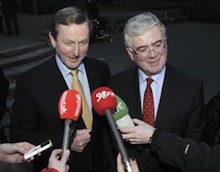 Fine Gael and Labour have reached an agreement on entering a new coalition government in the 26 Counties. Negotiations at Government Buildings ended in the early hours of this [Sunday] morning. Negotiations took five days although eventual agreement was never in doubt. The deal was separately endorsed by a special party Labour Party conference and a meeting of the Fine Gael parliamentary party this afternoon. The programme for government, released this evening, represents a vague compromise between the manifesto promises of the two parties. It remains largely aspirational in tone, while threatening up to 25,000 public sector job cuts. Fine Gael leader Enda Kenny admitted that the new government would continue the four-year austerity plan formed by Fianna Fail. He said the new government would set about reviving Ireland’s reputation in Europe and abroad. The 64-page ‘Programme for Government’ begins with a declaration that “a democratic revolution” took place on election day and that the 26-County state “faces one of the darkest hours” since it gained independence. The document reached the compromise on the year 2015 instead of Fine Gael’s 2014 and Labour’s 2016 for reaching the deficit target of 3 per cent. It affirmed Fine Gael promises for regressive new stealth taxes such as water rates “to achieve better quality water and environment”, as well as site valuation [property] tax in accordance with the requirements of the International Monetary Fund. Current rates of income tax together with bands and credits will be maintained. Top marginal rates on income will not be increased. There was no information on how the public sector cuts are to be implemented. However, it is understood jobs for all those currently in the public service will be protected, and their salaries maintained, in accordance with the Croke Park Agreement. Plans for the introduction of a ‘graduate tax’ for third-level education and changes to the new Universal Social Charge are to be subject to “reviews”. State-owned companies such as ESB and Bord Gais face a sell-off. The programme also promised resources would be found within the first 100 days of the new administration for a “jobs fund”. Sinn Fein leader Gerry Adams warned the new coalition would broadly implement Fianna Fail’s austerity plan. He said that in the new Dail, Sinn Fein would hold the new government to account and stand up for ordinary citizens. “The Fine Gael/Labour Programme will broadly implement Fianna Fail’s four year plan,” he said. “Undoubtedly many of those who voted for Labour, in particular, on the promise of change will be bitterly disappointed today. “The Programme for Government is bad news for low and middle income families. It is bad news for the low paid, those on welfare and public sector workers. On Thursday, it was confirmed Gerry Adams is to replace the Cavan-Monaghan TD Caoimhghin O Caolain as leader of the Sinn Fein parliamentary party. Mr Adams’s position as Dail leader is subject to ratification by the party’s ardchomhairle [leadership]. “Sinn Fein are here to do the business,” Mr Adams said at Leinster House, where he was accompanied by his party colleagues in the Dail. “We have returned a very, very strong team. We trebled our vote and our representation here in Leinster House. We’re here to deliver: not just for the people who voted for us, but for all of the people of this State and across the island,” he said. Commenting on the Fine Gael-Labour negotiations, he said: “This coalition which is forming is clearly going to be a coalition for cuts, supported by Fianna Fail. “Sinn Fein will be the only coherent voice of opposition and we will be a constructive opposition,” he added.